This kit contains everything you need for the suspension of the Artiteq Click Rail. A flexible hanging system can be integrated easily and quickly into your home with the Click Rail. In three simple steps you’ll be able to attach the rail to the wall. By clicking or sliding the wires with hooks you can create a flexible suspension of your decorations. This white rail is 200 cm long and has a weight-carrying capacity of 20kg per metre. 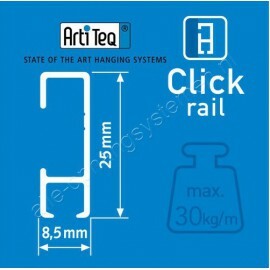 The Artiteq Click Rail is meant to be attached to the wall. This set includes; 1 x 150cm perlon wire, 1 x self-locking Picture Hanging hook, 2 x end caps and all the other mounting materials you need.